The lawyers at Breakstone, White & Gluck, P.C., provide experienced representation for persons who have suffered personal injuries or wrongful death as a result of a construction site accident. Construction accidents can occur on residential property, commercial property, or at industrial construction sites in Boston, Cambridge and other city areas. When someone is injured or killed on or near a construction site, the owner or general contractor or a subcontractor may be liable for any injuries sustained from an accident. A construction site accident can be extremely serious, and may cause permanent disability, loss of a limb, blindness, head injury, fractured or broken bones, amputation, scarring, and wrongful death. Often the medical bills will be large, and there may be a long period of disability and lost wages. Worker's compensation may pay for some of the medical bills and lost earnings, but worker's compensation cannot adequately compensate an injured worker for permanent losses and disability arising from a serious construction accident. Our attorneys represent bystanders who are injured in construction site accidents, drivers injured as a result of highway construction accidents, as well as construction site workers who are injured on the job. Our clients include laborers, carpenters, electricians, ironworkers, crane operators, plumbers, masons, painters, sheet metal workers, welders, heavy equipment operators, and all other construction trades. Under state and Federal laws and regulations, contractors and site owners are responsible for providing a reasonably safe work environment, and there are special laws in place to protect those who work in high places, such as on a scaffold, ladder or structural steel. Workers in all trades are exposed to a variety of dangerous conditions at worksites due to negligent and dangerous conditions and practices of architects, general contractors, subcontractors, product manufacturers, equipment suppliers, and others. Immediate investigation and preservation of evidence is often a critical element in proving a personal injury case involving construction accidents. Investigation involves examination of the scene while the evidence, such as materials and machinery, is fresh. It is often necessary to get court orders to preserve evidence. Prompt investigation of witnesses is also important. After a construction accident, it is also critical to establish contact with the investigating authorities, such as the Occupational Safety and Health Administration. General contractors and subcontractors, as well as material suppliers, may all need to be identified. It is also essential that you get prompt medical attention for your personal injuries if you are injured in a construction accident. If you were injured while on the job, then you should be entitled to workers' compensation benefits. If you have been injured in a construction accident, it is essential that you hire the best construction accident attorney to handle your case. The lawyers at Breakstone, White & Gluck, P.C., are experienced in working with top experts and getting compensation for victims injured in construction accidents. The injury attorneys at our firm handle cases from initial investigation, through trial, and, if necessary, all appeals. We will work hard to get you the best results. Through its experience and relationships with experts in the construction field, Breakstone, White & Gluck, P.C., is able to identify and bring claims arising from the negligence of contractors and subcontractors responsible for safe construction site practices. Because of its experience in the area of products liability, we are also able to identify accidents that have occurred as a result of defective products used on the construction site. Because the Massachusetts Statute of Limitations applies to construction accident cases, victims have a limited time in which to file their case. If you feel you have a construction site accident case, it is vital that you act immediately to protect your rights. Our Case Reports page describes some of the complex personal injury cases we have successfully handled on behalf of our clients. We have recently settled a crane accident case involving the wrongful death of the crane operator. 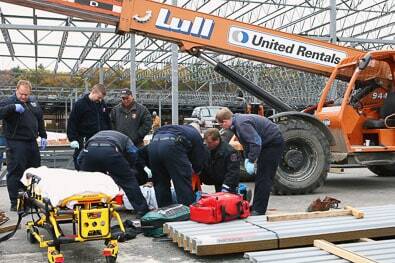 Read the full case report of this crane accident case. If you have been injured in a construction accident and wish to speak to a personal injury lawyer, please call us at 617-723-7676 (or toll free at 1-800-379-1244), use our contact form. Get your free legal consultation today with Breakstone, White & Gluck, P.C. Our Boston office is conveniently located in Government Center. Drive Safely Through Road Construction We have all looked forward to Spring this year, waiting for those snowbanks to finally melt so we can drive and walk and ride our bikes more easily.